Stopping traumatic blood flow has been one of challenges which our scientists and doctors had been struggling in resolving and developing cure. It’s been there ages since the first humans were born. It only made little progress here and there. However, a plant extract has been investigated which slashes the time it takes to clot a bleeding wound. Liquid bandage has been thought of before, and some are already out in the market. But those bandages are for surface cuts to the skin. It won’t help with bullet wounds or if an internal organ is cut during surgery. And so Joe Landolina has a bigger idea which uses a plant-based polymers to form a dam to stop bleeding in seconds.It was only when he tried it, however, that he found the polymers’ have the capacity to stick together “like Lego blocks” and to turn on the blood’s natural clotting process to stop even large bleeds surprisingly fast. As Landolina notes, the difference between stopping a wound in five minutes or in thirty seconds can be the breach between life and death. Winning FDA approval for new medical products is a slow process, even for external use, but Landolina’s startup Suneris has found a way to bring in money during what are normally hungry years for new biomedical companies. Suneris claim that, “Immediately after application, our gel stimulates the clotting process by physically holding pressure in the damaged blood vessel. The gel then rapidly activates the accumulation of platelets, which bind to the site of the injury to create a platelet mesh. Our gel completes hemostasis by accelerating the binding of the clotting protein, fibrin, to the platelet mesh, resulting in blood coagulation and a stable clot”. 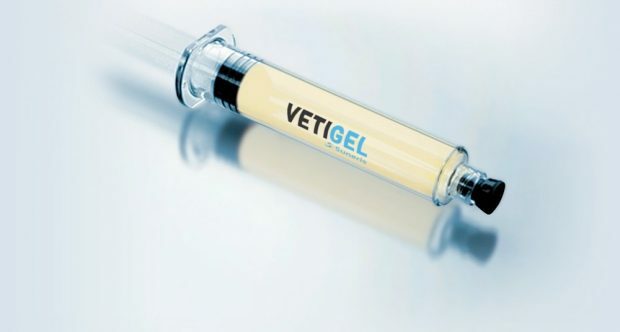 The product VetiGel is about to start selling to veterinary clinics, saving beloved animals.